Recent news stories about violence towards women in India made me a little nervous before we embarked on our Chinese New Year trip to Delhi, Kolkata and Darjeeling. Our first full day in Delhi happened to be Republic Day and we ventured out from our hotel into wide boulevards in New Delhi devoid of traffic and joined scattered pedestrians all making their way towards the procession site. We could hear military music from marching bands in the distance. Immediately I was struck by the fact that there were very few women among the excited onlookers. Groups of men chatted and laughed and formed most of the crowd which jostled for a view of the soldiers and then the huge colourful floats with animated scenes representing India’s states. Many of the men stared at us. This was another surprise; I had expected to be less conspicuous than in China and for Delhi to be more cosmopolitan than Ningbo. I had also expected most women in Delhi to be dressed in western style – again my expectations were wrong and I suppose this was one of the reasons people stared so frankly at me. I have spent the last few days feeling inappropriately dressed and have taken to wrapping a large shawl around my top half in an attempt to blend in! Gender imbalance is especially marked on the Delhi Metro system. In Shanghai or Beijing there are equal numbers of men and women travelling on the subway systems; despite the patriarchal nature of Chinese society and the preference for boy children, women are equally in evidence and seem to enjoy social independence. In Delhi many carriages on the subway were almost completely full of men, with perhaps half a dozen women. Women clearly don’t travel alone. Once we blundered into the ‘women only’ carriage, presumably set up to counter the problems for women of travelling on the Metro. We made a quick retreat as soon as Fintan realised he shouldn’t be there. But at the next station some men tried to get into the carriage, and a policeman on the platform had to bawl at them to get off or move – which they did only reluctantly. On our second day in Delhi we ventured out of the normal tourist areas to seek out Coronation Park, set up to celebrate the British decision to make Delhi into the imperial capital. We were looking for a sculpture of George V that had been moved from its canopy near India Gate, following Independence. This adventure involved a wild journey in a tuk-tuk – a small taxi on a motorbike. On the way back we were picked up by another such taxi. We had to share the small space with two women who did not look at all pleased to be forced to sit knee to knee with two westerners – especially the male one. The atmosphere was awkward until we were stuck in a traffic jam back in Old Delhi, nearer to the subway station. The younger woman spotted that the end of the sari of a passenger in another tuk-tuk had come adrift and was floating near the ground. She called out – to alert the woman, and turned to me and smiled. I wasn’t dressed like either of them but we seemed to bond in some way. We have now arrived in Kolkata, our second destination. We’ve spent the afternoon searching for more imperial sculpture in Victoria Park, which surrounds the famous Victoria Monument, built by Curzon to celebrate the monarch after her death. The park and the monument are hugely popular – seething with locals who troop around to look at the imperial relics, including the cannons used to suppress them. There were far more women around and about in Kolkata compared to Delhi. In fact the park was full of courting couples, cuddling under the trees and sitting on the plinths of the sculptures. Many families with mothers, grandmothers and children formed part of the crowds inside the monument. I still felt conspicuous, but rather more relaxed. India and China of course see themselves as developing nations that are strongly competitive. It is not only on grounds of economic development where China is clearly pulling ahead, but also I’d say in terms of gender roles and its treatment of women. I would be surprised if women felt unsafe in Chinese cities or unable to go out alone or with their female friends. That doesn’t seem to be the case everywhere in India. Sometimes I become lulled into thinking that I’ve got used to living in China and that I will no longer be surprised by what I see. But I was jolted out of my complacency this afternoon in Metro. I noticed a young woman in front of me at the checkout changing from slippers, new furry ones picked up in the store, back to her own ankle boots. I naively imagined that she would pay for the slippers along with her shopping. But no, once all her stuff had been put through, she gave back the slippers to the guy on the till. She’d just been wearing them to be comfortable in the shop! No one batted an eyelid. At the weekend we renewed our acquaintance with Landlady’s Dad, who appeared on Saturday afternoon in charge of The Installation of the New Water Heaters. Two young plumbers were in attendance, one wearing ear muffs against the cold. It quickly became obvious why, as none of them made any attempt to keep the outside door closed. Every time I got up to close it, they quickly reopened it. Why would you want to heat your house? Fintan and I sat shivering on the sofa, a couple of bit players in the main drama being enacted in our flat. Landlady’s Dad strode around, shouting into his mobile phone and occasionally at Young Plumber with Ear Muffs, now engaged in making maximum mess in our bathrooms. It didn’t occur to him to cover anything up, and soon the toilet cistern and surrounding accessories were covered in thick red dust. Once the water heaters were in place, Landlady’s Dad called me over to look at the fancy new digital remote control, covered in Chinese characters. Clearly he had no idea how to use it himself, and hilariously while Young Plumber demonstrated the temperature up and down arrows, Landlady’s Dad told me that my husband would know how to use it….. Young Plumber was quickly paid off and LD casually assured me that the old tanks now filling up our spare bathroom floor would be collected tomorrow. No one mentioned the mess. There are little piles of post-construction debris all around our compound and out on the street and by the new mall. Often a bit of the pavement gets dug up and then no one bothers to clear up the excess cement or left over pieces of stone. We were just experiencing the same phenomenon on a domestic scale. LD picked up pieces of spare pipe, a new shower head, wire and screws and offered them to retreating Young Plumber. ‘Bu yong. Not needed,’ he shrugged. Meanwhile, two days later Alice continues attempts to negotiate the removal of the old tanks, in between making arrangements for her recently announced and to us, unexpected, marriage. At one point she was checking out when the plumber might arrive, while posing for her wedding photos somewhere in Ningbo. I was profoundly embarrassed at the intrusion; she was completely unphased. We have been invited to a party in March that will take place after the honeymoon. Colleagues tell us that Fintan should prepare to make a speech. The actual marriage is apparently an unaccompanied visit by the couple to register and get a licence and seems already to have taken place. While we fly to India, Alice and her husband will take a honeymoon in The Maldives. Apparently Chinese people don’t need a visa to go there; someone has spotted the potential for Chinese tourists. A pity the Indian government don’t take the same view. She will return in time, as a good daughter and daughter-in-law, to spend the Chinese New Year with family. Meanwhile, the new water heaters work extremely well and once more we are enjoying hot showers. One last surprise – unlike every other appliance in the flat, the heaters are A rated – the best for the environment. In the short term the installation caused a commotion and took us time to clear up, but in the longer term maybe it represents a chink of light in China’s environmental problems. New stations and museums: vanity projects or necessary infrastructure? Train journeys during our first 18 months in Ningbo were made from the East Railway Station. This slightly decrepit building contained a modest waiting hall, usually crammed with hundreds of people ready to squeeze through the narrow ticket gates onto the platforms – a mere 8 of them. The approach to the station was a walk through a chaotic street, lined with shops and stalls selling food and drinks for the journey – steaming bowls of noodles, shiny chicken and duck legs, and corn-on- the-cob. Anxious and ineffective traffic police attempted to control the buses, taxis and cars setting down and picking up passengers across the road. From last week we have entered a different era. 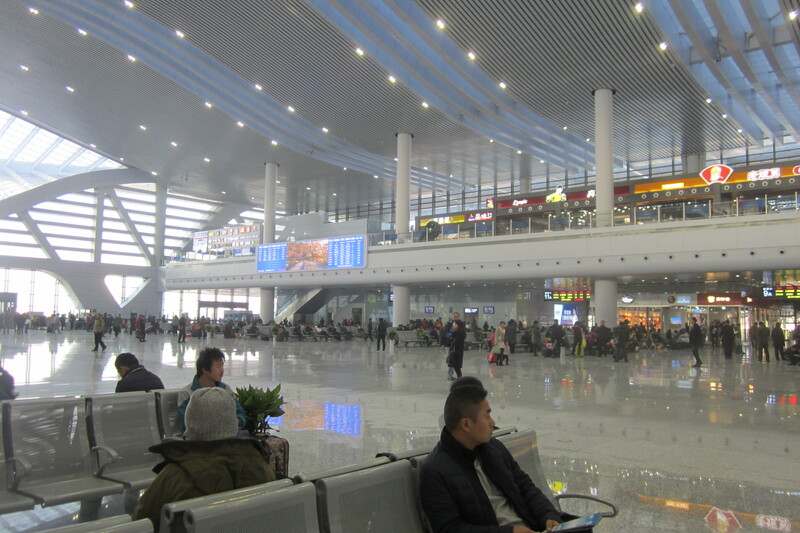 Not only can we travel on a high speed train to Shanghai – journey time 1 hour 50 minutes, instead of 2 and a half or 3 hours – but we embark on our travels through a spanking new station. For a Westerner, this building is more like an international airport. It has three storeys and is approached along a flyover, a highway rising up from the west side of the city, connecting to a massive new bridge. Outside, the entrance to the waiting hall is crowned by one of those lozenge shaped pediments beloved by airport architects, which attempt to sacralise what is really a vast hangar dedicated to speed and consumerism. White and rounded in the day, at night the pediment is filled with neon strip lighting, which hypnotically changes colour – purple, yellow, red, blue, luring people to this temple of modernity. Inside, the waiting area is on a dizzying scale. Glittering granite flooring recedes into the distance, clean Western style fast food chains are visible on the upper gallery, while 8 departure and arrival boards on either side show passengers which of the 15 or so platforms they should be choosing. Huge photographs of beautiful landscapes flicker between the boards – promoting the ‘Chinese dream’ and distracting from the pollution that this and all the other massive infrastructure projects cause. You can’t help wondering if Ningbo needs a station of this size. Travel by high speed train is wonderful, and for us comparatively cheap – a first class ticket to Shanghai is about £50 return – but for many people (average urban income is around £4,000 a year, rural income about half this) it is far too expensive, and they must continue to travel by bus and slow train. Local governments are criticised for investing in capital projects that benefit the rich and do nothing for the poor; for example much less is spent on hospitals and social security, especially for those who lost their jobs with the closure of state enterprises from the 1990s onwards. If you can penetrate the bureaucracy to get it, there is ‘minimum living allowance’ set at the discretion of local governments; it is usually around £20 a month per person. One of the main reasons for the investment in prestige projects, is that local governments are controlled by Communist Party officials looking for promotion. Every year these cadres are evaluated on their performance, and getting a station built or a new highway or bridge leads to a good number of brownie points. Clearing old neighbourhoods, destroying the livelihoods of people selling ‘unhealthy’ roadside food, making transport too expensive for the poorest, or encouraging more and more car travel to get to the station would, one suspects, not matter much. Even so, Ningbo’s new transport cathedral is dwarfed by our arrival destination, Shanghai Hongqiao. This station has over 30 platforms. 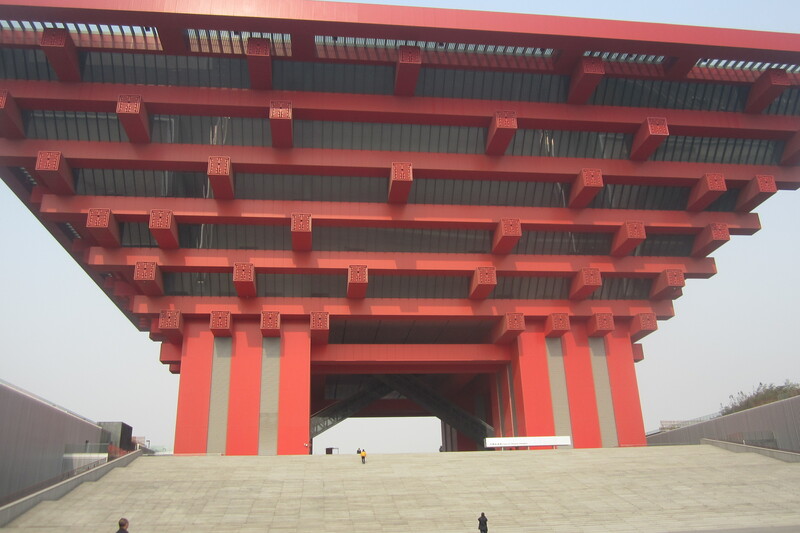 It was extended and modernised ready for the 2010 Shanghai Expo, and it is connected to the exhibition site by a clean, cheap and efficient subway system. We went there on our most recent visit to check out one of the few remaining pavilions, the Chinese pavilion, of course the biggest, now given fresh life as the China Art Museum. This is a 63 metre high, bright red structure, in the shape of an upside-down, stepped pyramid or an ancient crown. The obsession with size means that the visitor is not told what floor they are on, but rather how many metres high they have reached. The rooms and corridors are ill-suited to the display of most art works, simply because the size of the spaces overwhelms them. In an attempt to fill up the space, the Shanghai Municipality has commissioned a series of Western style, large narrative paintings to tell the history of Shanghai in the 20th century. These include ‘The visit of Einstein to Shanghai’ and ‘The first meeting of the Chinese Communist Party’. Another is a kind of triptych showing a high speed train. This is what might have happened to Tate’s Turbine Hall if the government of the day insisted on controlling the content of its exhibitions (‘The opening of Heathrow’s first runway’, ‘Brunel visits Paddington Station’, ‘The third victory of Margaret Thatcher/Tony Blair’ etc. etc.). According to a recent article in The Economist, the China Art Museum is but one of many tens of museums that have sprung up all over China, often high quality buildings designed by leading architects. Many of these museums are empty, lacking a permanent collection to put on display, and dependent on scarce temporary exhibitions, sometimes provided by cash-strapped European institutions. They appear to be yet further examples of infrastructure projects driven by ambition and the desire to appear modern and powerful, and yet somehow lacking meaning or an imaginative dimension that relates to a more human scale or need.